Cycling isn’t about politics, but it is. Now sure, one might feel that providing infrastructure to prevent deaths is “nanny state” – there are, of course, still those who mutter about ‘elf n safety nonsense that prevents deaths on construction sites. But is building infrastructure for mass cycling really leftie? Now, I’ll confess to being slightly leftie on a few things. But I could hardly be called a working class warrior, rather all mixed up. Comp educated, not from a financially well-off background, now done alright but firmly believe in paying one’s fair share and that shafting others isn’t the way to get ahead. Pigeon hole that if you will. So is cycling for everyone political? Is mass cycling infrastructure a leftie plot to curtail our freedom? True, the majority of mass-cycling people on Twitter appear to be left leaning. But this could well be a function of People on Twitter: after all the Conservative win in the election took the Twitterati by surprise. Let’s look at the appeal of cycling. So cycling is actually about the individual. Sure, the population benefits from reduced emissions and road deaths, which is accounted for under the socialised externalities of public investment in health budgets. But the individual gets to travel swiftly through towns, keep healthy and invest or spend the money they’d otherwise squander on travel for short journeys. However, implementing mass infrastructure is inherently political. We need to do things differently to how they were done in 1950 when we had fewer cars (never popular among some of the electorate). What’s more, we need to look at what hasn’t worked. Schemes that throw money at educating cyclists and drivers have not worked. Creating infrastructure on a par with the Dutch cannot happen without political will. So the politics of cycling is not party politics, but about councillors and governments making the decision to look at facts rather than relying on the hysterical reaction of the we-hate-change brigade. It’s the politics that requires politicians to get off their backsides, see where the problems are and see what’s worked. 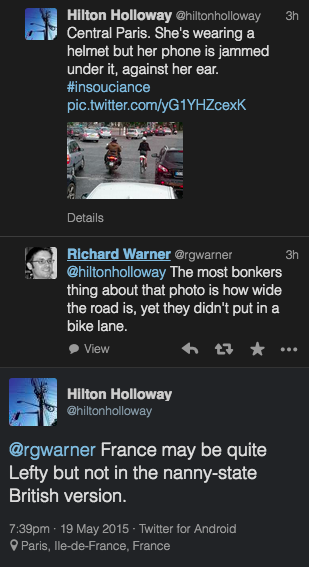 Infrastructure for cycling is not party political. But it does require political will. Author Stuff Rich WritesPosted on May 19, 2015 June 10, 2015 Categories BikesTags Cycling, PoliticsLeave a comment on Cycling isn’t about politics, but it is. News recently came out that the first, revised, mini-Holland proposal has been approved and work will start this winter. This development will undoubtedly help cycling, by providing a segregated cycle path alongside a busy road. Of equal importance, but thus far unmentioned, is the requirement to create liveable streets that encourage walking and riding for short journeys, rather than using the car as the default option. At the moment too many of Kingston borough’s residential roads are used as rat runs, making them unpleasant places to walk or ride. 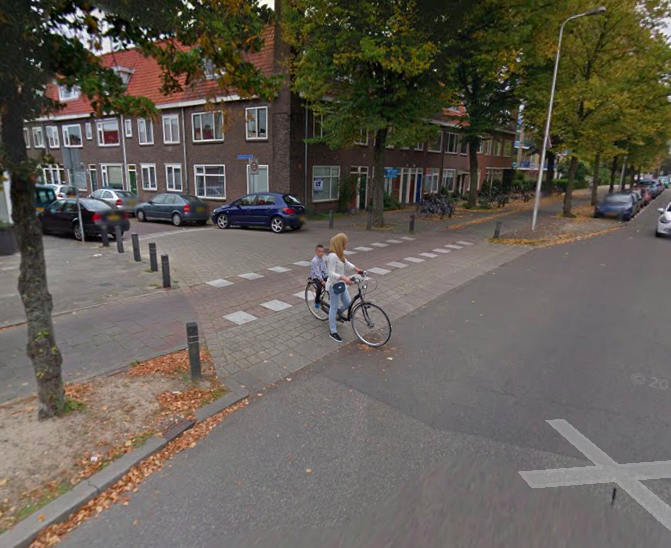 Given that the Dutch have been creating liveable areas for several decades, we should take a look at what they’ve done with the aim of stealing their best ideas. Once these are established we can experiment and share learning with them to improve yet further. David Hembrow has several excellent posts, where he describes how the Dutch achieve this and the benefits. Rather than doing this en masse, it seems sensible to apply an inexpensive experiment. We can measure the outcomes and improve on this as we learn. 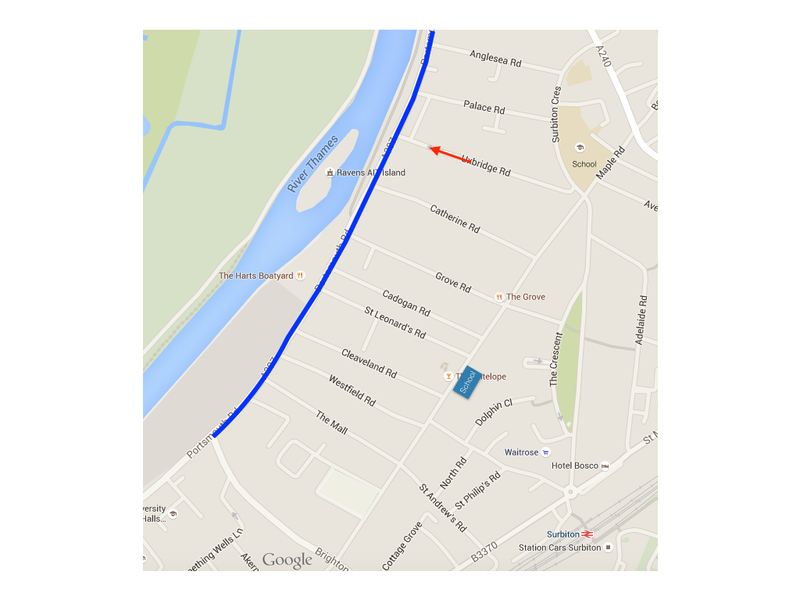 Let’s look at part of Surbiton, right next to the first mini-Holland segregated route. Firstly, we want to slow traffic. So the first step would be to place a blanket 20mph limit away from main roads. Arguably this should drop to 10mph past schools during arriving / leaving time, but that may require extra legislation. Many of these roads are already 20mph, but ideally we’d make this enforceable by design without having to place speed bumps everywhere. Secondly, we need to remove traffic. To this end, we place bike and people-permeable barriers to direct motor traffic to the main road and away from the remaining streets. 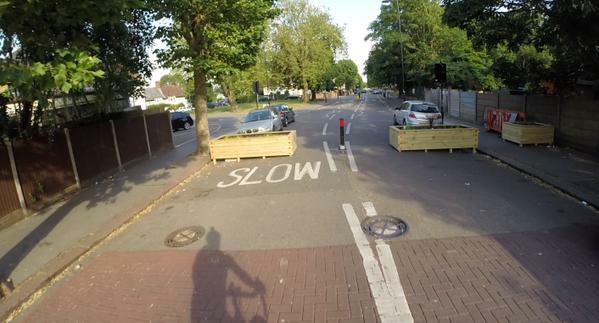 To begin with, this could be a large planter or similar temporary obstacle, as trialed within Waltham Forest.. Obviously, parking restrictions would be required near the barriers to enable vehicle turning. The aim of this is that residential streets should be cul-de-sacs as much as possible. The theory is that this fundamentally changes drivers’ behaviour – one is no longer driving to a distant destination, but to one’s own home and past one’s neighbours. Thus people start to look out for their children and drive more considerately. Driving slower is not such a hardship either as one isn’t looking to beat the traffic on the main road. The third stage of this is to provide explicit priority to crossing pedestrians and cyclists over access to the residential areas, emphasising the priority that a crossing pedestrian already has. This would naturally be best put in place only if the trial is successful. So here’s how this might look in practice. The first picture highlights the current situation, with the mini-Holland scheme in blue. The arrow shows an existing one-way street down Uxbridge Road. Maple Road runs past the school in blue and is a 20mph through road. It’s a convenient shortcut avoiding Portsmouth Road, but motor traffic really has no place here except for accessing homes. The road has a row of small shops and restaurants near the school so a full-scale rollout would need to look at any impact to these. In the suggestion below these would remain accessible via Maple Road; however the barrier in the middle prevents through traffic. At present, I don’t believe that Kingston has plans to remove rat runs. However, these are integral to the Dutch experience and should be considered. The health benefits from reduced noise, pollution and vehicle movements are massive. Furthermore, this creates a safer environment for active travel and is particularly suitable for areas with schools. Waltham Forest has demonstrated how these can be inexpensively experimented with. I urge Kingston to follow this lead.